It's been awhile since I posted last. Not too much has gone on. 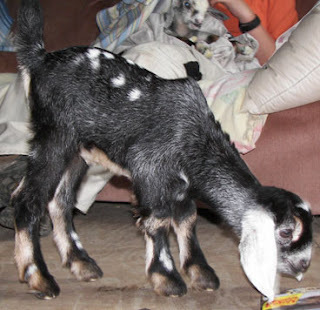 On Wednesday the 15th, Reata, one of our Boer/Nubian does kidded to a cute little doeling. Her sire was one of the MiniNubian bucks since Reata just needed to be bred. You would never think that this doeling has any Boer in her. . . just a good example why no NOA Minis should be registered. Anyway, we've already found a home for the little doeling. Thanks to Shanda for giving her and Willa's buckling a great home! 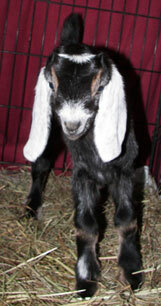 Here is a picture of Reata's Boer/Nubian/MiniNubian doeling. All of the kids are doing great. Verona's buckling's legs are all straight and perfect now! We ended up taping them, one with popsicle sticks, just so they would straighten out faster. It worked and he is walking like a normal kid now! Other than that, all the does are still milking great and everything is going good. I think Spring might finally be getting here. . . the trees are starting to get leaves and there is grass growing... YAY! It has been brown for months! Here's a flower pic ;). Time to go, busy day today. I thought I would post a few small articles that have helped people in the past. This one is on how to treat bloat. 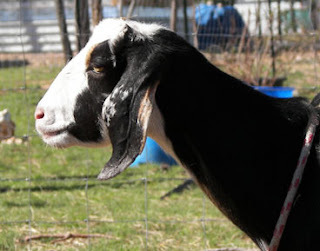 We have experienced goats getting bloat, and have treated them all successfully. This information is just from our experience - we are not vets or professionals. 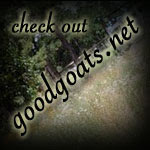 It is what has saved a few goats' lives. 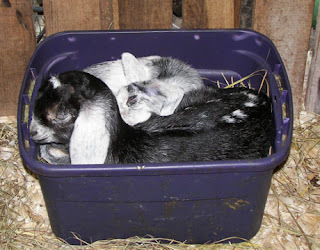 When a goat is bloated, the left side will be hard, and the right side will feel "airy." 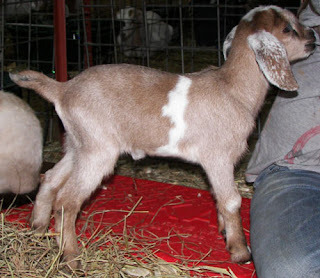 The goat will be much wider/bigger looking than normal and will usually not want to walk or move around very much. Thus, bloated. Bloat is usually caused by goats either eating too much grain (that they are not used to) or getting out on new lush green pasture. Bloat is a very serious condition and needs to be treated immediately. For treatment, there are a few ways to go. 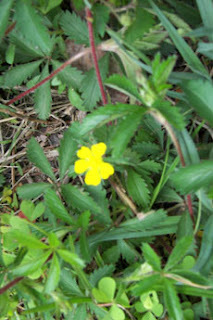 - my first line of bloat treatment is to go to the Therabloat bottle or the like. There are many brands of bloat treatment for goats and cattle. The dosage is normally on the bottle. 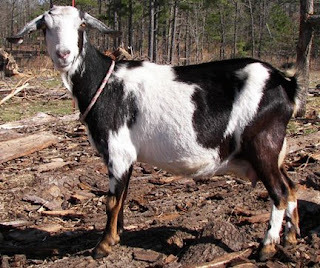 - if I do not have the above, give about 1/2 cup of Oil (mineral, corn, etc), add a couple of big spoonfuls of Baking Soda to the Oil, and drench it down the goat's throat with a syringe (withOUT a needle). Do this slowly and carefully so you do not get it down the goat's windpipe. - I always give C&D ANTITOXIN. This will not hurt the goat. It is a water soluble, and this if it is not needed in the gut, the goat will pee it out. This helps balance the rumen and calms things down. 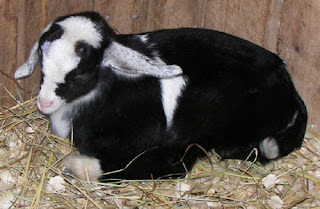 A lot of the time, after a goat has bloat, a few days later they will come down with Enterotoximia, and that is a very fast, life threatening situation also. 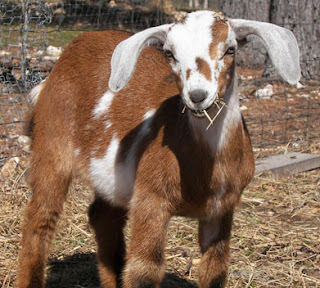 If it is an adult goat, I give about 10 cc of C&D ANTITOXIN, sub-Q, a couple times until they recover. With a kid, I would give about 3-5 cc. - along with bloat, some goats will also get diarrhea. You can let it run it's course, just make sure the goat is staying hydrated and offer then electrolytes a few times a day. - if you know how to tube a goat, you can tube them and let the air out. Only do that if you know how to tube a goat, safely! I hope this helps. Again, this is just our experience. We are not veterinarians or professionals. I got some of the website updated today. I updated the Kids page so there are pictures of all of the kids and the new kids are up now. 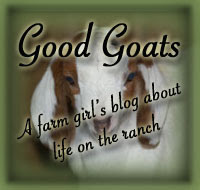 I also updated the Standard Nubian does' page with all of the new does (Maggie, Rosie, Doloris and Almond Joy). I still have to put Willa up on the MiniNubian doe page, and her buckling Sapphire on the bucks' page. Other than that, I think we are pretty much up to date though. If there is anything that you see that needs to be fixed, let me know! I would appreciate it. 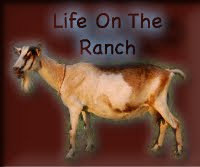 I thought I would give an update on other things going on at the ranch, besides goats. We put all of the 6 yearlings (Quarter Horses, you can see them at www.diamondmlivestock.com) out on the 40 acres and they are finding a lot to eat out there already. They were not very interested in their hay the other day! I was also given one of the yearling geldings for my birthday. His barn name is Tank, registered name is Royal Gypolena. Other than that, I don't think there is too much going on :).